Ages 3through 8. Help parents stimulate language development at home with these creatively-illustrated parent handouts. Common activities such as going shopping, cooking dinner, looking at picture books, and driving around town are excellent contexts for parents to provide meaningful language development activities for their children. 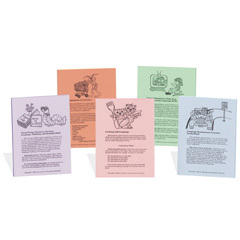 There are five activity sheets and receive enough copies for 50 parents.